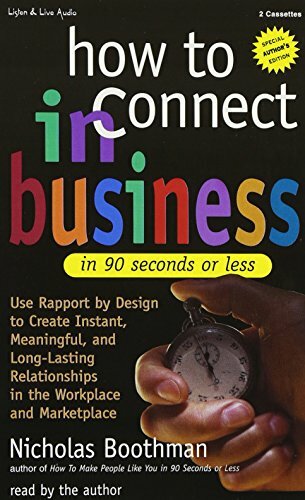 The author brings his innovative system of forging instant connections to the workplace, providing the fundamentals for creating and maintaining effective business relationships. In business, we can't make a living selling to our friends. We don't have the luxury of choosing our colleagues or our managers, our clients or counterparts in other companies. So learning how to establish rapport with all sorts of people is crucial, which is what Nicholas Boothman teaches, simply yet powerfully, in his step-by-step program. It begins with the ABCs of Neuro-Linguistic Programming—Attitude; Body Languge, including how to synchronize with another person; and Congruence, where communication is coordinated both in what we say and how we say it. Then Boothman describes the four key business personalities—Dreamers, Persuaders, Controllers, Analysts—and how to communicate with each one. He shows how to nail down the Big Idea in a 10-second presentation, how to be a schmoozer instead of a dry fact-talker, and how to establish credibility and authority right out of the gate. Filled with skills, techniques, and creative exercises to help make the most of every type of encounter and relationhip, this book is a direct connection to success.